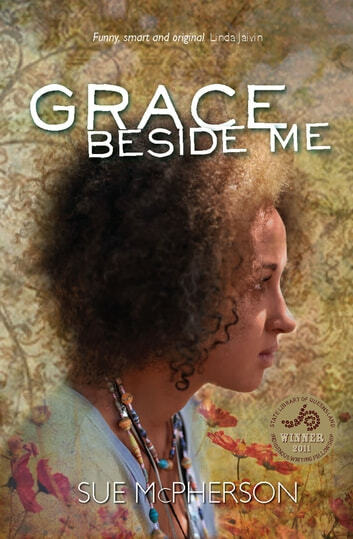 Written from teenager girl Fuzzy Macs perspective, Grace Beside Me is a quirky, warmly rendered story of home and family life in a small town. The black&write! judges remarked on the authentic feel of the Indigenous home life of Fuzzy Mac and her grandparents — her guardians since the death of her mother. Awkward episodes of teen rivalry and romance sit happily alongside the mystery of Grans visions and an encounter with a ghost. The story sits against a backdrop of amazing characters including the holocaust survivor who went to school with Einstein; the sleazy, once-good-looking Mayor; the little priest always rushing off to bury someone before the heat gets to them; the wife basher up the road; Lolas Forest, dedicated to Lola, a traditional Aboriginal woman who met Ned Kelly — and Nan and Pop. Grace Beside Me interweaves the mundane with the profound and the spiritual — it is full of wisdom and good advice (Fuzzy calls Nan the queen of all knowing) on everything from how to to sit a while in the bush and connect with country to how to properly hang out the washing.